Till very recently I used to keep lamenting about the falling standards of Telugu Cinema and expressed my disappointment whenever I would end up watching anything and everything that was being projected as a good or great film, as I would disagree with the popular verdict on most occasions. Of late though I have made peace with myself and with the industry as by now I understand that the industry is passing through a tough phase, a phase that it has to pass through with great tact and control, to get itself rid of the mediocrity that prevails and all the ills that go along with it. Adding fuel to the fire is the constant political unrest that has now ensured that the erstwhile state of Andhra Pradesh has gone on to get split into two. For the Telugu audience for whom movie watching is a way of life and not a hobby, it is a little disheartening to see them starved of their regular dose of entertainment from time to time. Against this scenario I know that there will be the odd S.S.Rajamouli film (looking forward to his Baahubali now) or some surprise in the form of a small film like Uyyala Jampala that would come up from time to time. For the rest of the content that’s emerging from the industry my logic is simple, as long as the film is entertaining I am still okay with it. I do not expect anything radically different from these so called mass hero films anyways. Also sometimes an attempt to try out something interesting and innovative can also turn out a little tricky, as witnessed recently in the case of Sukumar–Mahesh Babu’s 1-Nenokkadine. This brings me to Race Gurram, which has been in the news ever since the film got announced by director Surender Reddy and producers Nallamalupu Srinivas and Dr.Venkateswara Rao towards the end of 2012. This marks the first time that popular Telugu actor Allu Arjun was teaming up with director Surender Reddy, who has had a reasonably good track record so far. Allu Arjun’s previous film Iddarammayilatho (2013) was reasonably well received and even his recent cameo appearance in his cousin Ram Charan’s Yevadu seemed to have worked as the film has turned out to be one of the few hits of the current year so far. Race Gurram (Race Horse) has been keenly awaited by Allu Arjun fans who went ballistic as expected just by seeing the initial teaser itself. The film revolves around two brothers, Ram (played by Tamil actor Shaam) and Lakshman aka Lucky (Allu Arjun). Ram the elder brother is an honest cop and someone who always believes in doing things the right away, someone who has been a model student in his childhood and is now a decorated IPS officer. Lucky on the other hand is totally unlike Ram and a typical carefree youth who lives his life on his terms. Their parents, especially the mother want the brothers to live happily together like the legendary Ram and Lakshman, but in reality the brothers are at loggerheads with each other always. Ram is on a mission to expose the corrupt exploits of a don Shiva Reddy (Ravi Kishan) who now harbours political ambitions. In the course of Ram and Lucky’s constant struggle for one-upmanship, Lucky ends up taking off with Ram’s Police vehicle and this event ends up triggering off a series of events which results in a tug of war between Shiva Reddy and Lucky. What happens from thereon forms the rest of the movie. If you are wondering if the film doesn’t have too many characters as seen in any typical Telugu mass movie or if the film doesn’t have any romance angle, then don’t worry at all as the film doesn’t intend to try anything dramatically different :). Though Lucky is busy trying to score over Ram initially and later Shiva Reddy, he does manage to find time to fall in love with Spandana (Shruti Haasan) and the two of them even manage to later reunite Ram with a girl he liked during his college days, Shweta (Saloni). And yes there are hordes of characters of all kinds who pop in and out at regular intervals. Manoj Paramahamsa’s cinematography is effective, in particular he makes the otherwise randomly appearing songs look good on screen. Talking of the music this is another assembly line work from Thaman.S who revels in churning out album after album without any standout song usually. Here again you may like the songs (despite the odd placements at times) on screen but it’s highly unlikely that you’ll be humming them a few months from now. 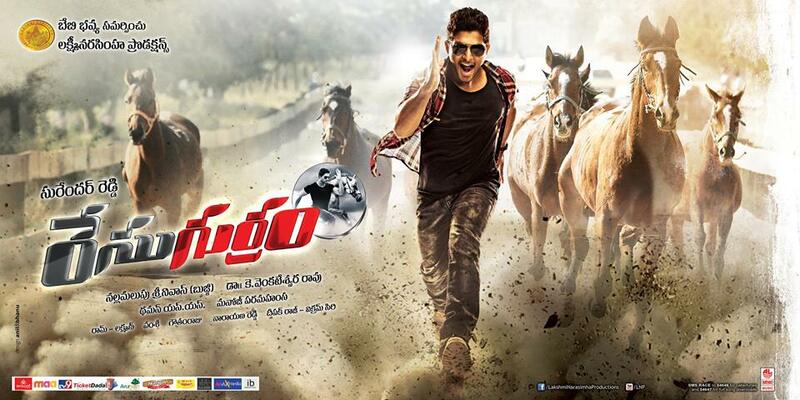 As with typical Telugu mass hero movie templates Race Gurram too has a long run time of around 163 minutes. Why this unnecessary fascination for majority of Telugu directors to stick to run time of 150 minutes and beyond is something which always beats me :). Even if you aren’t an Allu Arjun fan director Surender Reddy has an ace up his sleeve in the form of the one and only Brahmanandam who leaves his mark once again,this time in a 20 minute cameo towards the end of the movie as “Kill Bill Pandey”. He packs in so much energy and fun in that brief period that you are sure to leave the auditorium with a smile even if the rest of the film was irrelevant for you :). Surender Reddy also probably felt that it’s better to keep the focus on Allu Arjun and his skirmishes with Shaam and Ravi Kishan, rather than dilute the focus with the romantic angle. So Shruti Haasan has to just look good and dance well in the film, nothing too difficult for her :). Ravi Kishan as Shiva Reddy leaves quite an impact and is another addition to the countless other Bollywood actors who feature in Telugu cinema often. Ravi Kishan is ably supported by Mukesh Rishi, for whom such roles are a cakewalk by now. Sayaji Shinde doesn’t have much to do and Prakash Raj is a little irritating in a funny role. Ali, M.S.Narayana, Pragathi, Tanikella Bharani, Jayaprakash Reddy all do what is expected of them, nothing special about their presence though. Posani Murali Krishna for a change doesn’t irritate and is funny in the role of a politician. All said and done Race Gurram is a typical Allu Arjun film where he gets to mouth powerful dialogues, romance the heroine in style, dance like a dream and bash up the baddies as well. Needless to say this is a film and a character that is right up his alley and he makes sure that his fans are entertained very well. Surender Reddy hasn’t tried to do anything remarkably different and has focused primarily on keeping the fans of Allu Arjun happy and also to ensure that for the general audience too there is a general dose of entertainment if nothing else. An energetic hero who is in control all the way through and a super duper cameo by the actor who redefines comedy time and again are what Race Gurram is all about. Going by the box office reports so far the producers must be feeling happy with the end result though :). This race horse doesn’t run smoothly all the while, as it canters for a while and even strays off course briefly before crossing the finishing line. sethu, that was nice writeup.. its a strange story about how you have made peace with telugu films. Pretty much resonates with me too as that’s how i feel myself about telugu films.i look them as my guilty pleasure pretty much like those colorful martial arts fantasy films that china turns out.people flying all over the place and dragons and what not.Speaking of race gurram , i am not a fan of Allu arjun who lacks the star charisma and diologue delivery skills of a Mahesh babu even though he’s pretty athletic and Surinder reddy made a horrible film called Athidi with Mahesh , a cheap rip off of Man on Fire.But he’s a rather technically competent director. fan but I find him to be pretty agile and flexible when it comes to dancing,decent with dialogue delivery as well. Reddy too.Speaking of Mahesh Babu,he’s indeed the most charismatic star among the present lot of Telugu heroe’s IMO.